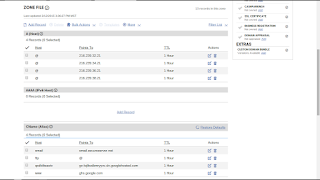 Verifying the URLs involved, in the dashboard Publishing wizard, is as important as examining a Dig log extract, or an HTTP trace. This will be the case, when dealing with various "blogspot.com" connectivity problems, researching a custom domain problem, or a dashboard or ownership problem. Both screen prints, and text copies, are very useful - and not redundant. Both a screen print, and a text copy, of the Publishing window (and / or the browser address window) is very useful, when diagnosing connectivity problems - or possibly, researching ownership issues, or similarly vanished blogs. And with a custom domain, similar detail from the registrar zone editor is useful. A text copy of the contents is needed, to avoid having to re type the URL - and maybe cause a different problem when comparing the URL. And a visual copy of the Publishing wizard is good, to identify the context of any problem. Let's look at two blogs - and what we need to examine / verify. 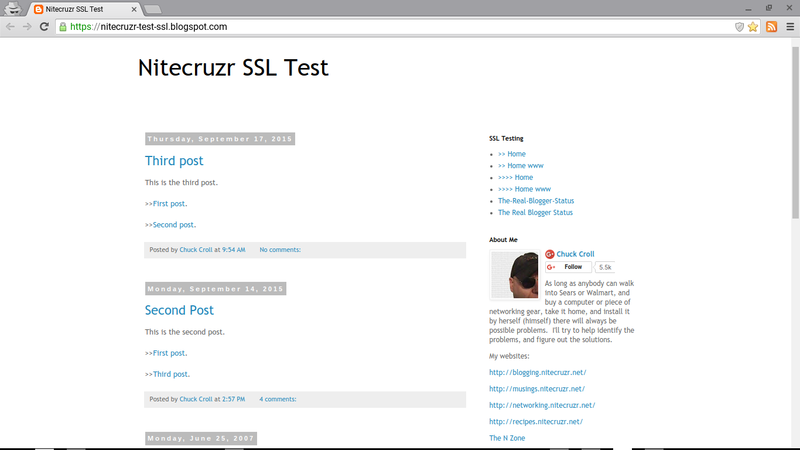 My test blog, published as "nitecruzr-test-ssl.blogspot.com". Here, we see a "blogspot.com" URL, in the browser address window. Here, we see the Blogger dashboard Settings - Basic page, for a "blogspot.com" published blog. The Publishing display, for a "blogspot.com" published blog. If you are requesting assistance with your native Blogger blog, the latter details, in both a screen print and text copy, will be useful. My blog, published as "blogging.nitecruzr.net". Here, we see a custom domain URL, in the browser address window. 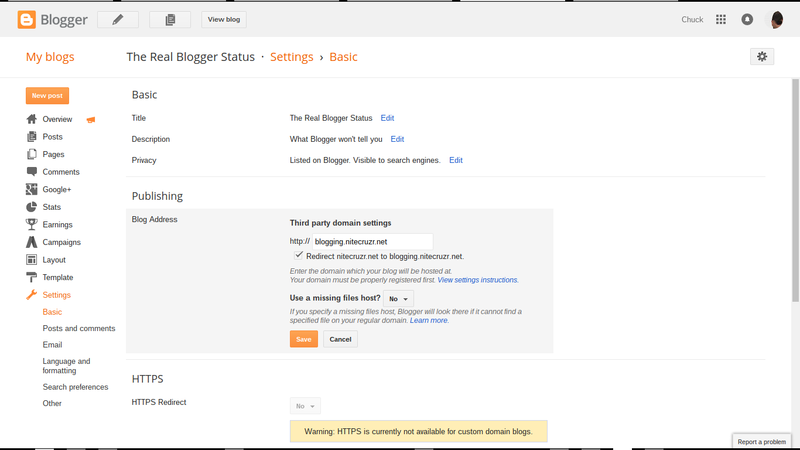 Here, we see the Blogger dashboard Settings - Basic page. for a custom domain published blog. The Publishing display, for a custom domain published blog. With a custom domain published blog, next click on "Edit", and make a second screen print. The second page of the Publishing display - which only applies to a custom domain published blog. You maybe have seen this display, similarly formatted, in an infamous "Error 12" or similar display. The domain root redirection, properly selected. X   Redirect nitecruzr.net to blogging.nitecruzr.net. If you are requesting assistance with your custom domain published Blogger blog, the latter details, in both a screen print and text copy, will be useful. A zone editor display, for my domain "nitecruzr.co.uk". 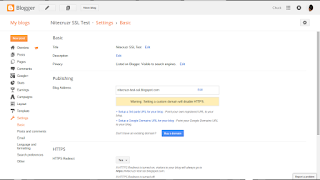 A zone editor display, from GoDaddy. Every registrar will have a different display. If you purchased the domain using a credit or debit account, the bank statement and / or charge advice will frequently have a description which details the purchase. In some cases, this will include the domain name. Comparing the URLs in the browser window, and in the Publishing window - and in Dig logs and zone editor displays (for custom domains) - we can identify typographical errors, and other mistakes. Typographical errors can be a cause of various problems, when publishing blogs to custom domains - and to "blogspot.com". Some problems result from failure to copy and paste, properly. They can be as challenging to diagnose, as failure to observe registrar name server syntax. Having verified the URLs, in some cases, you will continue with an affinity diagnosis, and with a differential diagnosis. This is all part of my simple 12 link test set. You, the blog owner, may consider "duplicate" and "redundant" to be synonyms. When we research a blog problem, "duplicate" != "redundant". Many confusing problems have been solved, by comparing combinations of various above details - and by finding inequality, in one or more displays. 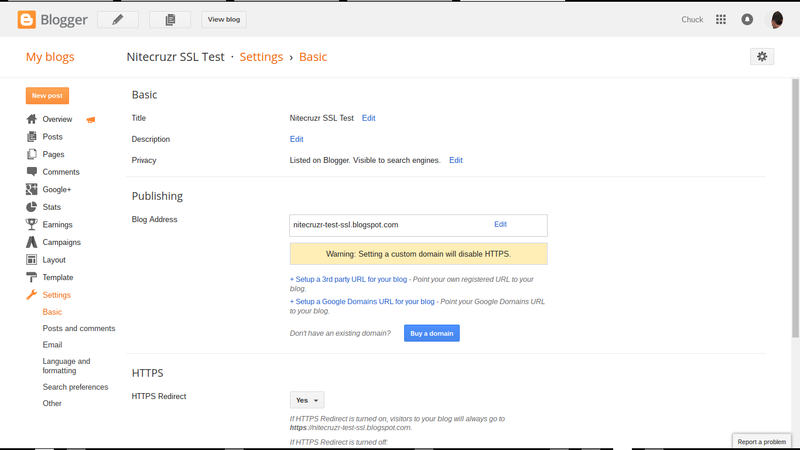 Diagnosing problems with #Blogger blogs can require careful diagnostics, using details found in dashboard screen prints and detail text copies, in Dig logs, and in HTTP traces. All details must be carefully compared, both visually and using text extracts, to diagnose some problems. Much of this may seem superficial, to experienced support analysts - yet be obscure to some blog owners. 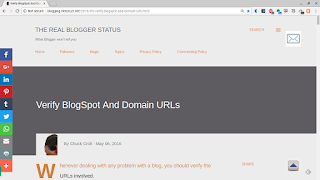 When i m trying to add custom domain without www in custom domain settings, it says "Blogs may not be hosted at naked domains (ex: yourdomain.com). 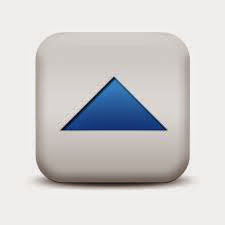 Please add a top-level domain (www.yourdomain.com) or subdomain (blog.yourdomain.com)." How can you add your custom domain without www ? You setup "pshindi.in" with asymmetrical DNS - and you can only publish to "www.pshindi.in". www.pshindi.in. 28800 IN CNAME ghs.google.com. You should be able to select "Redirect pshindi.in to www.pshindi.in" - but the blog will be visible as "www.pshindi.in". I appreciate the answers you've provided, but sadly, even with all of this information and a great deal of effort, I cannot self-help. I registered the custom domain name "windycitychick.com" through Google over a decade ago. 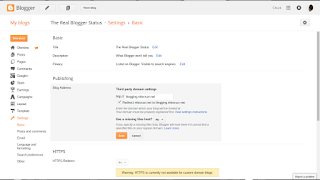 I used the Blogger dashboard to access and edit the blog. I have not tried to access the blogger dahsboard since since September 2014. 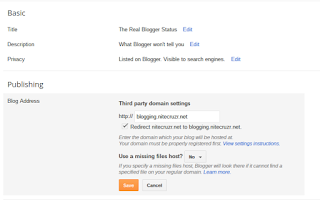 I can view my blog online. The web site still exists, but I cannot access the dashboard. 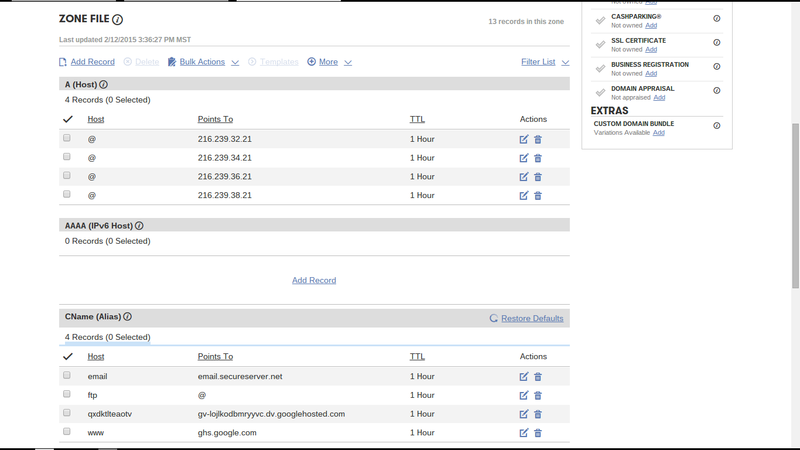 The saved link I used to sign in and access the dashboard now links to a Google admin sign in page. I've signed in, but I cannot find a link anywhere to existing blogs. I am only offered the option to start a new blog. 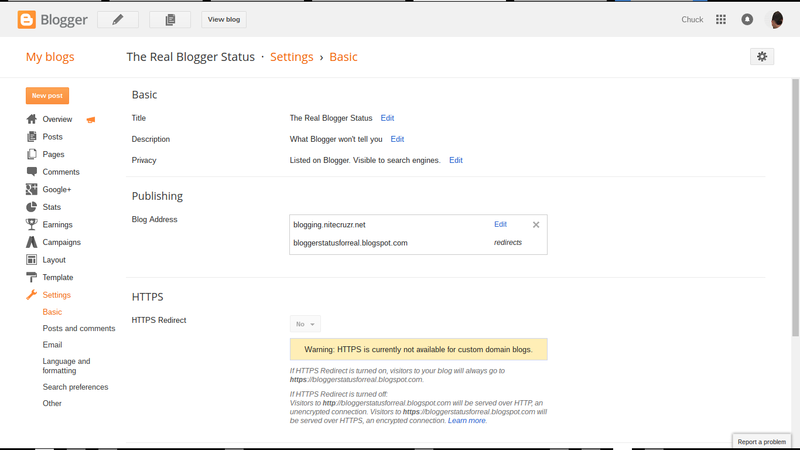 Is it the case that I have to sign up for pay services (G Suite) to access the blogger dashboard and add/edit posts for my existing blog? I appreciate any help you can offer, or direct me to someone else? 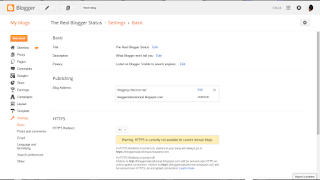 I've spent the past 12 hours reading FAQs and help from other users, but nothing that is suggested helps me to access the blogger dashboard for my blog. Your Google Apps domain name, windycitychick.com, was successfully renewed with godaddy for one year. You can now continue using Google Apps through March 1, 2017"
"!You are currently signed in as xxxx @ windycitychick.com which is a legacy Google Apps free edition supported via this G Suite Admin Help Center. Use the resources below, or Upgrade to G Suite Basic to contact our team of G Suite experts directly via phone, chat, and email."